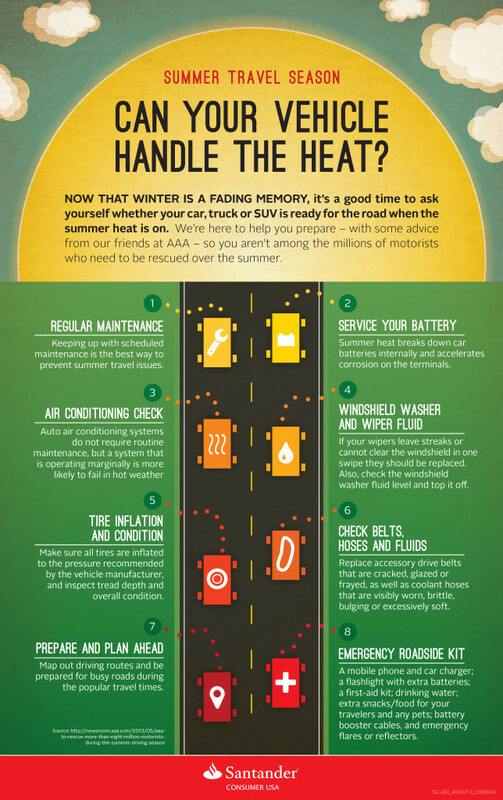 Now that spring has turned into summer and the July 4 holiday is upon us, it’s a good time to ask yourself – if you haven’t already – whether your car, truck or SUV is ready for the highway when the heat is on. Millions of Americans already are on the roads as long weekends, summer road trips and vacations turn up the temperature, and, if you’re not prepared, take a toll on you and your vehicle. But it’s not just recreational travel that should have you thinking about summer driving. Commuting when temperatures rise also can be tough on both car and driver. Fortunately, we at Santander Consumer USA Inc. are here to help you prepare for all the challenges that summer driving dishes out – with some useful advice from our friends at AAA – so you aren’t among the millions of motorists who need to be rescued during the summer driving season. Take a look at our top eight tips below, and then see if you and your vehicle pass the heat test.